Tucked out of the way in New Cross, the London Particular has always been just that little bit far away to travel to, but always so tempting, a siren calling towards New Cross. 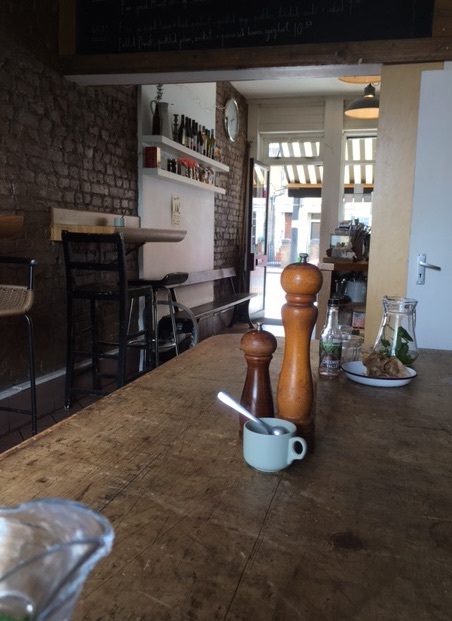 The reviews of the food and the place were intriguing, while the coffee is roasted by HR Higgins, a roaster with a café that always seems closed when I get the opportunity to pass by (which is usually Sundays). So it was with some relief that I finally managed to get to the “LP” a couple of weeks ago. Towards the end of a row of shops, the space outside the café has plenty of seats where you can enjoy a spot of lunch and/or a coffee on a warm day. Inside feels more cosy. A bar on the left of the entrance forms a corridor with the wall that you walk through to get to a room with communal table at the back. In addition to the communal table, there are a series of individual high chairs along the wall. At the back of the café is a window with an old device sitting on it. “An old digital multi-meter” I said before being corrected by my sometime companion in these reviews, it has a dial, it must be an “analogue multi-meter” then! It did seem to be able to measure current and resistance and it did have a dial to indicate the value measured. Quite why it was sitting, unconnected, on the windowsill is anyone’s guess. 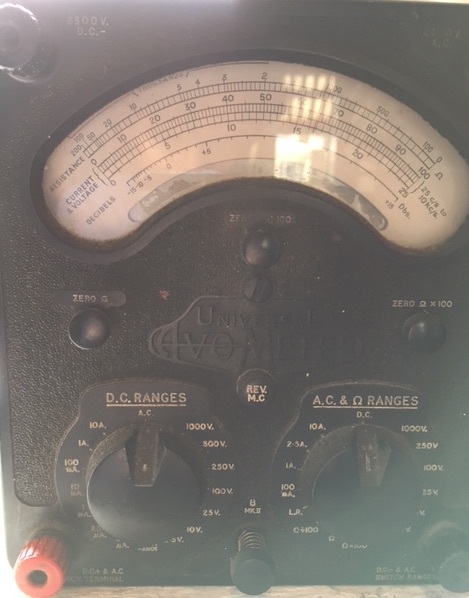 An Analogue multi-meter. But why was this sitting on the windowsill at the back of the cafe? The lunch menu is good. Enough items there to provide choice, few enough that each can be done well. Significantly, the true London Particular, the pea soup, was not on the menu on the day we were there. We had a light bite of lunch, a black coffee and shared the jug of mint infused tap water that was placed on our section of the table. At the other end of the table, another customer was enjoying her lunch. So although communal, the table gave us enough room to be private and have our own conversation. A mirror along the wall above the table reflected the blackboard menu between the table and the bar. Thinking about mirror writing reminded me of Dr Florence Hensey and his letters of lemon juice ink. Back in the eighteenth century he had operated as a spy out of coffee houses on the Strand and in St Martin’s Lane¹. Spying on England for France, his letters, written in lemon juice (invisible ink) passed without detection before the frequency of correspondence drew suspicions. Times move on. Spies would surely no longer write in lemon juice or even mirror writing to avoid detection. Lunch on a week day was a very good time to experience this café. It must get quite crowded at weekends or brunch times. So it was good to be able to sit back and contemplate our surroundings from the back of the café. In the foreground of our view though was the water jug. With fresh mint leaves stacked inside, it was evident that air had become trapped under some of the leaves forming tiny bubbles. How had the air got stuck there? Was it merely that the leaf was blocking the air bubble from rising through the water? Could there be slightly more to it? There is a popular expression “like water off a duck’s back”. Perhaps it arose because the duck’s back is often thought one of the most waterproof surfaces we know. But what makes the duck so waterproof? Why does water just form drops and then fall off the back of the duck? It is not because the feathers are oily. We sometimes ‘wax’ our waterproofs with a grease to make them resistant to getting wet and so perhaps we have thought that the duck’s back was just a bit greasy? And yet a study done back in 1944 showed that mere oil could not account for the waterproofing of the duck’s back. Before delving into why the duck’s back is such a waterproof surface, it’s helpful to know how to quantify ‘waterproof-ness’ in the first place. To measure how waterproof something is, we use what is known as the contact angle, which is the angle that the drop makes with the surface on which it is sitting. Surfaces that are not waterproof (technically we call them “wettable” or hydrophilic), have very low contact angles, the ‘droplets’ of water on the surface are flattened. 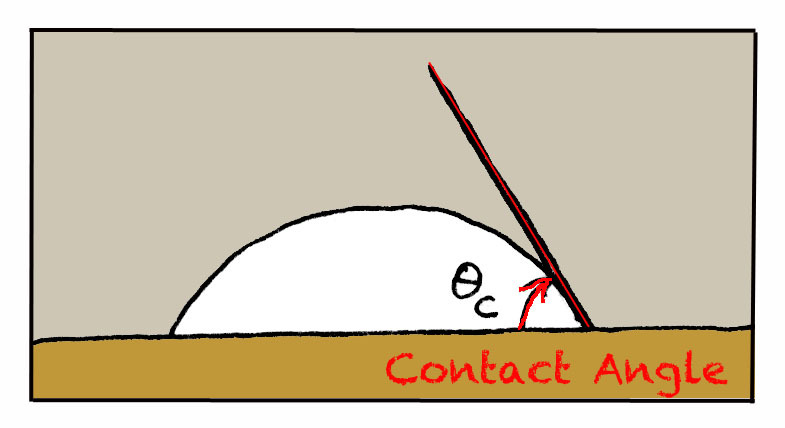 Waterproof surfaces on the other hand (imaginatively called hydrophobic), have contact angles which are much greater than 90º (it may be helpful here to have a look at the cartoon illustrating this point). Droplets that formed on a duck’s back had contact angles much greater than 90º, indeed, they formed almost spherical drops of water. What could be going on? How ‘wettable’ a surface is can be defined by the contact angle that the drop makes with the surface. Image thanks to artemisworks. The answer is in the details of the feather. The feather is not a flat surface but a material that has irregular protrusions and structure at the micro and nano-scale (one thousand and one million times smaller than mm scale respectively). These protrusions trap air within the feather and so effectively suspend the drop above the feather surface. The droplet does not have a flat surface on which to spread out. The structure means that the contact angles of the drops of water on a feather can be even higher than 150º; the droplets are held up almost as if they are spheres of water. A breath of fresh air under water. 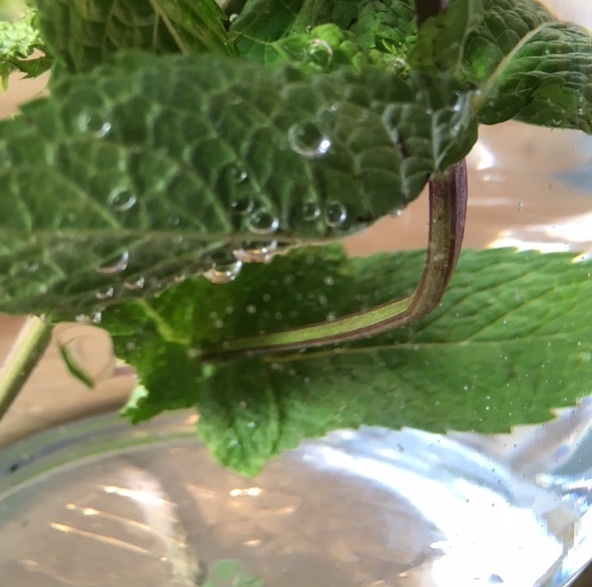 Air bubbles trapped under mint leaves. Another creature that uses the irregular protrusions on the hairs on its legs for waterproofing is the spider. The hairs on the legs of a spider mean that, just as the duck’s back, the spider’s legs are extremely waterproof. But it also means that air is trapped under the droplets. Consequently, if a spider finds itself submerged under water, the air under the droplets forms little bubbles similar to those under the mint leaf in the London Particular. And this allows a drowning spider the air it needs to breathe. Nanostructure helping the duck to dive and the spider to survive. 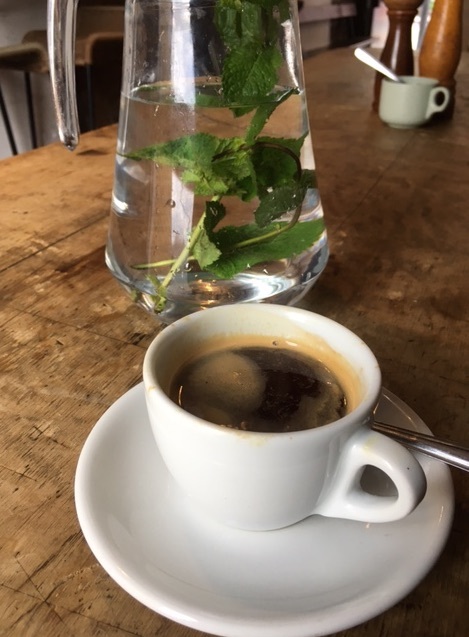 And the mint water to be particularly refreshing on a warm day in a very pleasant place for a spot of lunch and a coffee.